AN INTERVIEW WITH PARI NAMAZIE, a passionate interculturalist based in Vienna, who has lived in India, Iran and the U.K. Pari holds a PhD in International Human Resources Management (2007) from Middlesex Business School in London and owns a non-profit organization focusing on the Iranian diaspora. 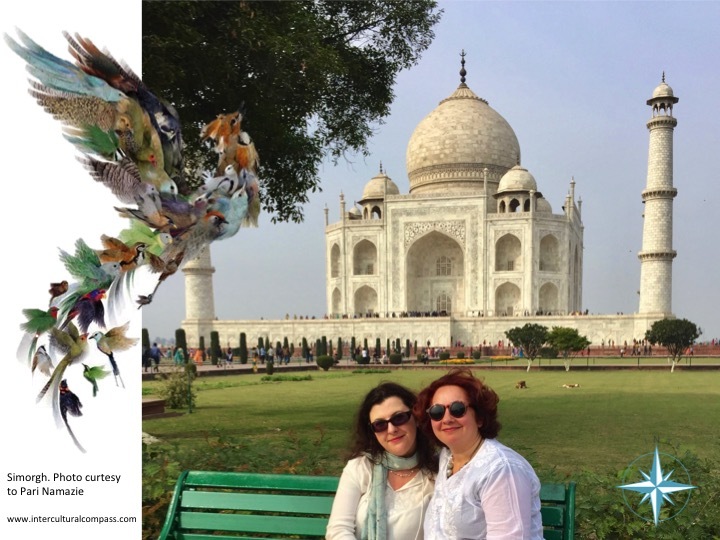 Joanna: Pari, you cannot imagine how happy I am we have found time and space to talk about your intercultural odyssey and your projects inspired by your unique life journey in this beautiful corner of the world – in Agra, where we are sitting in front of Taj Majal. You were born 1000 plus kilometres from here. What does it feel like? Pari: Being here feels very much like being home. I was only four when I left Kolkata but it still feels familiar – food, people, driving. My mom comes originally from India and India is very much a part of me. Joanna: What was you journey like after you left India? Pari: I moved to Iran and I was there from the age of four to eighteen. During that time, we witnessed the Islamic Revolution, the eight-year war between Iran and Iraq and then I moved to UK to study business. After my studies I returned to Iran and started my family as well as a number of businesses. Almost ten years ago we moved to Austria, to Vienna, where I am based now. Joanna: Your journey inspired you to start the project called Being Iranian. Could you share something more on this initiative? Pari: One of my activities is that I run a non-profit organization called The Simorgh. It’s mission is to foster intercultural dialogue between Iranians and Europeans. Part of our work is to enrich the perception of the Iranian identity. The project called Being Iranian talks about identity, as an Iranian living inside Iran or one living outside, with Iranian heritage. We organized a photography competition and the responses were overwhelming. The result of our project is a wonderful book with pictures and short stories accompanying them. This can be found on our website. This year we started a new project called Being the Other – this is a film project and focuses on storytelling about Iranian migrants and being part of a diaspora. The project film is titled Tales of Belonging. Joanna: The name of your organization is Simorgh. Could you tell us something more about it’s origin? Pari: Simorgh is a mythical story written by the 13th Century Persian poet Farid u-din Attar, from his book Conference of the Birds. It is about a flock of birds who question their purpose and goal. They are looking for a spiritual leader. An elder bird tells them that there is Simorgh in the far away land that will have all the answers. So they fly to find the Simorgh, their journey is full of challenges and struggles. One by one birds drop out until finally only thirty birds reach their destination. Tired they look around, but they do not see the Simorgh. Hod Hod tells them: Look in the pond, and there they see their own reflection. The Elder continues: „You have searched for the leader but it is you! It is each of you. You have got the potential to lead yourselves. That is the story of Simorgh. Simorgh literally means thirty birds. Joanna: What a powerful metaphor of the participatory leadership! Is this the area of your interest as well? Pari: Yes, it is about looking at how we can empower each other, how we can reach out to potentials we have as individuals, as communities, as organizations. And this is what we are doing at Simorgh, but it is also something we are promoting and doing as interculturalists, for instance at SIETAR (Society of Intercultural Education, Training and Research). Joanna: The intercultural field is very complex and before unfolding talents and discovering potentials people often need to deal with relocation stress and the so called culture shock. Your approach to deal with culture shock is to involve creativity – no matter whether taking photographs, painting, writing, and devoting your soul to music. Art is an integral part of your projects. You yourself have moved several times across cultures. What was the greatest culture shock you have actually experienced? Pari: Interestingly, I faced the greatest culture shock in my own country during the time of the Iranian Revolution. My school got closed; I went to an Iranian conservative school, wearing hijab and my entire life changed overnight. We tend to think that culture shock is something we experience while moving to another country but many times it can also be experienced in the home country. Joanna: Thank you for this eye-opener, Pari! It shows once again that we tend to use stereotypic thinking patterns to reduce complexity of the surroundings. In the 21st century we need out-of-box thinking more then ever. It just came to my head that I know plenty of people, me included, who experienced the culture shock when middle Eastern European countries faced transformation of the political system after 1989. I am happy we have time to continue our conversation on the way from Agra to Jaipur and then to Pune. Thank you once again.